This mutation in the word "virtue" has the effect first of narrowing the meaning of the word, reducing it to a matter of sexuality alone; and then of belittling and disparaging the sexual virtues themselves. These virtues, chastity and fidelity, have been further trivialized by the popular conception of Victorians as pathologically inhibited and repressed. Thus "Victorian values" have been associated with piano legs modestly sheathed in pantaloons, human as well as table legs referred to as "limbs," and books by men and women authors dwelling chastely on separate shelves in country-house libraries. In fact, these were not the normal (or even abnormal) practices of real Victorians. They were often the inventions of contemporary satirists (writers in Punch, for example), which have been perpetuated by gullible historians. "The woman who draped the legs of her piano," one historian solemnly informs us, "so far from concealing her conscious and unconscious exhibitionism, ended by sexualising the piano; no mean feat." In fact, it is this historian who has sexualized the piano and has imposed his own sexual fantasies upon the Victorians. I have a minor correction. While I must necessarily take no position on the perpetuation of satire by gullible historians (lest I get into a conflict of interest), and I cannot claim to know who is right about sexualizing the Victorian penchant for covering piano legs, I can state with some confidence that the historian Himmelfarb criticizes was not the first to sexualize the piano. I don't know whether this means the couple had a child or just merged with each other, but the presence of the bedside table indicates some that some sort of ongoing intimacy occurred. I scrupulously take no position on whether any of this could have been avoided had the piano been appropriately covered. As to what the reference to the "exact temperature of a cardinal's nest" might mean, I'm tempted to speculate that it might involve a failure of the human fertility cycle, and I'd note that by 1934 Gala seems to have left her fertility cycles behind her. 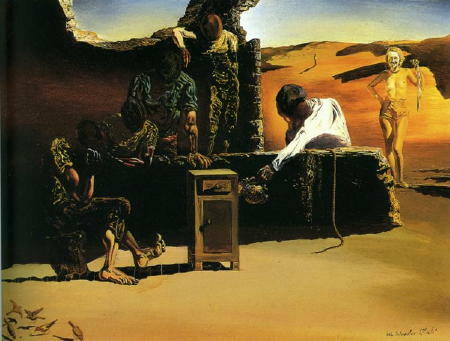 Whether Dali was making any judgment about virtues or values (or what that judgment might have been) I'll leave to others. Politics is surreal enough as it is. I've seen her legs and believe me you don't want to see them. If you take a picture of her and crop everything above the waist she could be mistaken for a grand piano. Actually she is doing us all a favor by wearing those pantsuits. On the other hand, she has to work with what she was born with (as we all do) so she can't help it if she has piano legs. I'm more concerned with that ultra-liberal mind. Disproportionately thick calves and/or ankles on a woman with otherwise normal body weight. No wonder Hillary Clinton always wears pant suits. She's got a humongous set of piano legs. Democrats of the female persuasion, difficult as it is sometimes to tell, are off limits when it comes to insults. Not once has Mr. Letterman joked about Hillary Clinton's piano legs, Donna Brazile's weight, Carol Roberts' (the Palm Beach county balloteer and marionette for team Gore) gravely voice, or those Palm Beach voters who can't punch a chad and look like cross-dressers. Such attacks are cruel. But, John Goodman playing Linda Tripp on Saturday Night Live, now that's funny. I never thought about this before, but the meme is definitely out there. So I have to ask what if -- just what if -- Senator Clinton's trousers are intended as a sort of piano leg coverup? If we dovetail this into Ms. Himmelfarb contension that "'Victorian values' have been associated with piano legs modestly sheathed in pantaloons," what are the implications for the sexualization of pianos? Might the latest campaign represent a desexualization of sorts? 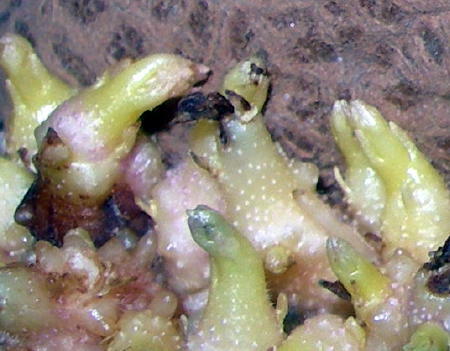 Today is March 1 -- a strange day for several reasons. According to Wikipedia, today is the first day of Spring in Denmark, while in Australia, today is the first day of Fall. If one begins each year on March 1, till the next March 1, then each date will have the same day number in this year, regardless of whether it is a leap year or not (e.g. December 25 is always day 300), unlike counting from January 1. This is due to the fact that the Gregorian and Julian calendars are based on the old Roman Calendar, which had March 1 as the first day of the year. The addition of the leap day of February 29 (which is what causes the days of leap years to fall on different day numbers) is a continuation of the February placement of the old Roman calendar's Mensis Intercalaris (a shortened extra month inserted to bring the 355 day long calendar into rough alignment with the seasons). That's enough to drive anyone crazy. What I'm trying to figure out is why the day does not appear on my calendar. 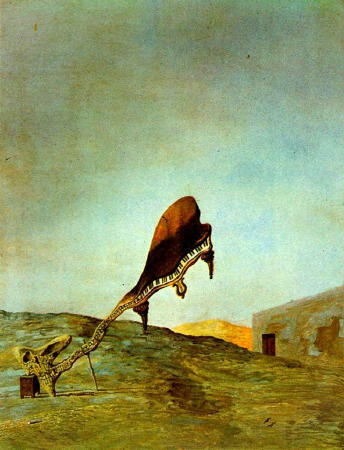 Dali was a surrealist who relied on the paranoid critical method (which assumes, among other things, that nothing is coincidental, and that mistakes are important). 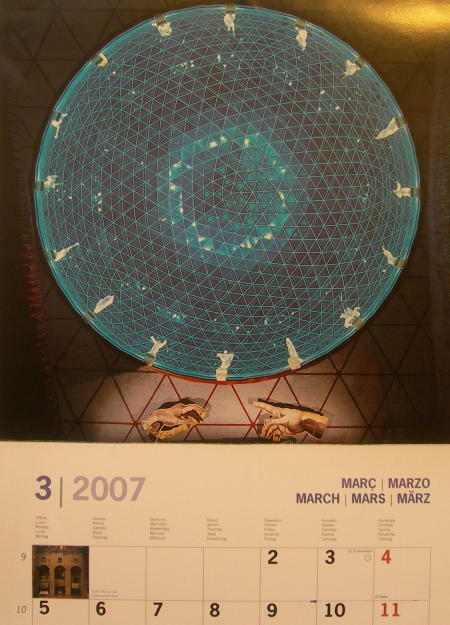 The theme of the March calendar is the geodesic ceiling of the Dali Museum in Figueres, Spain, which is surrounded by strange figures arranged in a manner evocative of a calendar (albeit 16 of them instead of 12). The blank box in the calendar which ought to belong to March 1 is directly underneath the the figure at the bottom of the calendar which is being pointed to by the index finger of the floating hand. The calendar has an international flavor, as it is translated into five languages and includes more holidays and religious observances than I knew existed. The cosmic significance of the galactic-like dome speaks for itself. I know this doesn't prove that there's any significance to today's missing date, but considering its importance, I suspect cosmic significance of some sort. Whether this cosmic significance is accidental or deliberate is beside the point. Far be it from me to correct the sacred. What to do on a missing date which will live in mistakenly unmistakable cosmic significance? I think I'll try to rationalize the sublime, and sublimate the rational. MYSTERY DISAPPEARANCE UNRAVELS AS IT DEEPENS: In another amazing "coincidence," it was on March 1 that Dali's depiction of the crucifixion (which he had done for the Rikers Island jail) disappeared. As it turned out, it was stolen by prison guards and officials. The drawing, a surrealist image of Jesus being crucified, hung in the prison cafeteria for years before being moved to a lobby where officials thought it would be safer. Riker's Island's roughly 15,000 prisoners do not have access to the lobby, which is used only by prison personnel. "Who knew that it might have been safer left in the cafeteria?" a spokesman for New York Mayor Michael Bloomberg asked. Who knew? Dali knew, that's who! That's why he wrote on the dedication -- right on the painting -- that it was for the prisoners' dining room, dummy! "For the dinning room of the Prisoners Rikers Ysland [sic] - SD". That's certainly typical of Dali's mangled way of writing in English, but the sincerity of his message is obvious. A former Rikers Island assistant deputy warden has been acquitted of charges that he masterminded the theft of a $250,000 Salvador Dali sketch from the prison. A jury acquitted Benny Nuzzo, 51, on Friday after a monthlong trial in State Supreme Court in the Bronx. 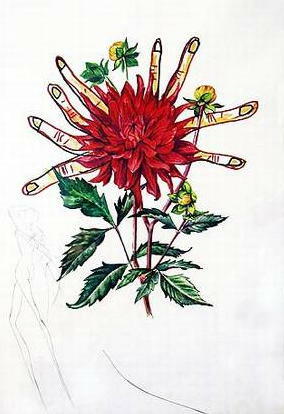 Nuzzo had denied any role in the theft of the sketch, which was reported missing on March 1, 2003 when someone noticed that the original had been replaced by a copy. Three other men were charged in the theft, correction officers Timothy Pina and Greg Sokol and former assistant deputy warden Mitchell Hochhauser. Hochhauser pleaded guilty in September to one count of attempted grand larceny and was sentenced to one to three years in prison. Sokol, who cooperated with prosecutors, testified against Nuzzo at trial. Sokol and Pina still face charges in the case. 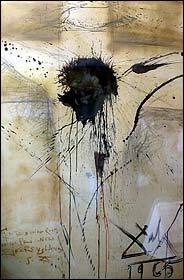 Dali created the ink and pencil sketch, which depicts the crucifixion of Jesus, after he called in sick to a planned visit to the prison in 1965. The sketch has not been seen since it was reported missing, and Hochhauser has claimed that Nuzzo destroyed it. Nuzzo, who was fired after his arrest, plans to try to get his job back, his lawyer said. I'm more concerned with the destruction of art than with theft. Stolen property can always be returned. Destruction of art might not be a crime against humanity in the legal sense, but I think it's a crime against culture -- something IMO morally worse than theft.